What the heck was that thing? Sprayer Tractor | Flickr - Photo Sharing! Geez, never seen anything like that on the road here, guess its hydrolically or electrically driven on each wheel ? Looks almost like a dang transformer. Wonder if it was planned or not. Last edited by Conrice; 07-04-2012 at 04:46 PM. 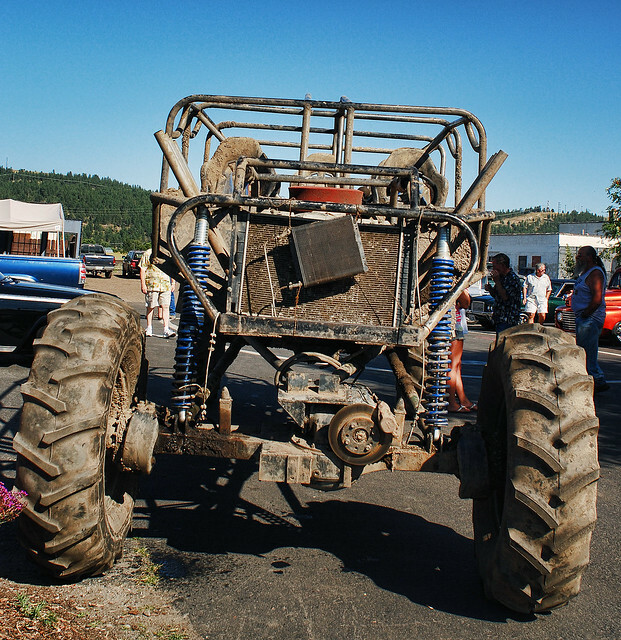 Well that looks more like a 'typical' mud bogger. Not getting a bike under that one tho. but they even have a huge show specifically for those vehicles and airboats. its funny, you have the coast - nothing southern about it, but go 15 miles east of where i'm at - that's all they live for! and there's a few other ones too. if you go to a gas station on a friday night in my area - you're guaranteed to see a few trucks pulling trailers with those mud buggies on them fueling up for the weekend. ya, they may have bigger tires, but the axles are way too low - you're right. Yea, Orlando is weird too. Very big city sometimes but really no big city. On the east side where I am its' more woodsy and country folk. Hunters and such. On the other coast where our beach house is its all 'beach' with a little trail guys thrown in. There are some mud boggers but not enough mud bogging (that I recall) to go too extreme with your vehicle. Its still has to be beach-able when the 'bettys' roll into town.